These "Discussion" pages let you know how we have structured this site, as well as provide answers to the numerous emails we get each day. The site not a collection of "odd projects" and "ideas" that lead no-where. It has been developed from resources that have been built-up over a period of 20 years by a teacher of electronics, Colin Mitchell, who has had his own electronics design-and-service business and employed staff to manufacture all types of electronic products. During this time Colin has written 25 electronics books containing projects for the hobbyist and articles to help you understand the "jargon" of electronics. This site contains many of these projects as well as a number of new designs. They all "dove-tail" into each other to build a library that will help you enormously when creating your own projects. All you have to do is work your way through the pages and "electronics will come alive." If you have ever wanted to pursue a career in electronics, now is the time. The projects start at the beginning with simple designs and take you through to microcontroller applications. Electronics is one of the most enjoyable fields you can experience and can offer a life-long career. Colin Mitchell has never "gone to work" in his life. "Work" has always been an interest, a challenge and an enjoyment. By taking up electronics, your life can be filled with an interesting career that makes it a pleasure to be involved in. The range of areas is enormous, from low-voltage, consumer, industrial, servicing, design, analogue, digital or programming, to name a few. No matter what your areas-of-interest, electronics can find an application. Our website offers the first "stepping-stone." It gives you the "feel" of electronics and lets you know how it works. All you have to do is put a project together and feel the sense of achievement. If you like handling small components and soldering, you have found your niche. If you can "see" how a simple circuit works, you are well on your way to understanding the things we will be presenting. How much do you know about electronics? Click Here for a 50 question test. Before we talk about specific sections of the site, the first thing you should learn is the "Art of Soldering." We have articles and "do-nothing" projects that teach the art of soldering, as well as surface-mount projects and kits to help you solder these tiny components. This is the way electronics is going. Surface-mount assembly is faster, cheaper and smaller than conventional through-hole design and eventually conventional components will dry-up from the market. Until that time comes, we can take advantage of both types of components and enter the wonderful world of electronics. The first skill you will need to master is soldering. All POPTRONICS Interactive kits are supplied with fine solder and this is one of the most important items to improve your soldering skills. Fine solder improves your workmanship 100%. It does this by allowing you to feed a smaller amount of solder onto your iron and creates a much smaller connection. And here's a point no-one has ever mentioned before: If you add solder to a connection while the board is almost upright, the amount of solder remaining on the connection will be less than if the board is placed flat on the work-bench. This is one way to create very small connections. The other essential item is a soldering station. It doesn't have to be a station, but the soldering iron must be temperature-controlled and you must have a holder for the iron. It's absolutely disastrous to have a soldering iron floating about on the work-bench. It really boils down to a soldering station as they are low-cost and fully adjustable. A suitable one is available HERE. You will also need some fine solder. Once you have a soldering iron, you will want to know how to select the correct temperature. It's simple: Turn the temperature down so that the solder just melts when it touches the tip of the iron. This is loosely called the "melting-point." This is not hot enough. The temperature must be increased for two reasons. When it is increased, the flux melts faster and the joint is cleaned more-thoroughly and the time to make the connection is REDUCED. This is another point that has never been mentioned before. It's actually quicker to solder at a higher temperature, and the parts stay COOLER! That's why you need a temperature-controlled iron. You must be able to adjust the temperature of the tip fairly precisely so the temperature can be correctly-set to achieve quick soldering. If your iron has a digital readout, a temperature of 325°C is suitable for delicate work as soldering can be performed very quickly and the components don't have time to heat up. Each connection should be soldered as fast as possible. It should be complete within one second. If you push each component against the PC board with your fingers, you should not get "burnt fingers." This is the simplest and easy way to make sure the components are not getting damaged. Many components can withstand high temperatures for a few seconds but some are easily damaged. LEDs can lose their brightness, transistors can lose their gain, electret microphones will become "noisy," and air trimmers will melt at the slightest increase in temperature. By holding a component, you are adding a heat-sink and reducing the temperature rise. Now we come to the construction-side of things. You can start with simple projects or look at our Test Equipment section. All our projects are built on fibreglass boards with an overlay (component identification) and solder mask. This means only the solder lands are visible and this prevents solder spreading to adjacent lands. The lands are also pre-tinned to help with a quick connection. However it is absolutely impossible to make a quick solder-joint without the assistance of flux. The flux cleans the lead and the land to create a shiny connection. It also helps to make the final connection very small in size. If the iron is a little hotter than you think it should be (as we suggest), the connection is also kept very small. By tilting the board as mentioned above, the connections are also kept to a minimum. When you are fitting the components, add only one or two at a time and snip the leads after soldering. Never snip the leads before soldering as you may snip them too short and they won't get connected. Don't bend a lead more than 45° as this makes it difficult to snip. It also make the component difficult to remove, if it needs to be replaced. This is just the start to learning how to solder. All you have to do is develop your skills by putting a project together. Once you are confident you can put a project together without "lifting the lands" or damaging a component, you will want to put more of them together. It's just a matter of starting. One of the most important topics on everyone's lips is the environment and the use and wastage of ENERGY. I consider it is one of the most important topics of today. The cost of energy is the controlling factor for almost everything we do. At the moment it is in the hands of big monopolies and they are making enormous profits from everything they provide. Don't forget, profits come after all the exploratory expenses and running costs. Energy costs are spiralling and if you want to start to analyse inflation, this is where to begin. Fortunately, during the recession it has dropped to about $60.00 per barrel and is currently $80. This shows the enormous greed of the speculators, who artificially raised the price and kept it high. Possibly the most important aspect of the world's sustainability is the use of its natural resources and the re-cycling and disposal of waste products. There has been a lot of discussion about the cost of "conventional" energy, the cost of alternate energy and the cost of "free energy." First of all, nothing is FREE! I am still waiting to see the car that runs on water. The presenter of a seminar said a "water car" was sitting outside a lecture theatre and 5 of his friends went outside and looked under the bonnet. I asked: "Did you take a photo? Did you get the licence-plate?" "Did you ask the driver to come to our meeting?" Water technology is still a SCAM, just like the Roswell invasion by extra-terrestrials. Don't believe anything until you see it. And then you can still be tricked. Take the example of the con merchant who fooled investors with "TV down the telephone-line" SCAM. (This has recently been exposed). He had a camera in one room, connected to a box and phone line. In the other room he had the phone line connected to a box and TV set. Sure enough, the signal was coming through and the picture was perfect. So the investors bought into the SCAM. Later it was found a very fine fibre-optic cable was added to the mains cable of the camera and TV. The signal never passed down the phone line! The scam was so simple, but no-one picked it up. So, you can forget about anything that looks "too good to be true" - things like FREE ENERGY don't exist. Before you rush into "saving the world," consider the cost to the environment, of producing items needed to produce alternate energy. This can sometimes outweigh the cost of simply burning coal, oil or liquefied gas. In this article we will look at the the real cost of producing all types of energy and leave it to you to "consider the costs." Everything we do will be referenced to a known consumption - a 1kW radiator bar. We all know how effective a single bar radiator is. It will heat a "standard room" (3m x 3m or 10ft x 10ft) with 8ft ceiling (2400mm) and when it gets to 22°C, it will stabilize at this temperature, if the outside temp is about 15°C. This means the heat-loss equals heat-input and at 22°C, the heat losses of the room are a constant 1,000 watts. Furthermore will say it takes 1kW to produce 1HP of work from an electric motor as the efficiency is about 80% for small motors. For larger motors the conversion factor is 746 watts equals 1 HP. But here's a staggering comparison. A single person uses about 1kW of electricity on average per hour (24kWhr per day) for lighting, heating (via a radiator) and refrigerator. Cooking and hot water is via gas. A car, on the other hand, uses about 87kWhr for a 100km trip. That is about 40HP delivered to the wheels and 50kW dissipated in heat. This is for a car that uses 10 litres of petrol per 100km. This is equal to wasting 50 radiator-bars of heat to travel 100kM. Can you imagine the heat released by 50 radiator bars! Now you realise what is contributing to the heating of the planet (I am not saying this is causing any problems) - just the comparison of our energy usage. Now we will cover the cost of "conventional energy" - ELECTRICITY and GAS, as supplied to a standard house in Victoria, Australia in 2011. These figures do not include "Service charges" etc. In other words, a single radiator bar using electricity will cost 17c per hour or 5.1c if it is powered by gas. Bottled gas, called BBQ gas, is the most expensive, as it has a "filling cost." Electricity is 100% efficient. There are no flue-gasses or losses. Gas is 75% efficient as about 25% of the energy goes up the flue as "gasses of combustion" when used in central heating. Gas is quite often used for "burners" in "cook-tops" as it is "instant-heat" and can provide more energy than electricity. An electric element is limited to 2400 watts whereas a small gas burner is 1.1kW, medium is 1.8kW and large is 3.1kW. A Wok burner is 4.2kW. Clearly, this amount of output cannot be provided by an electrical supply. A 42,000 BTU/hr hot water heater will produce 120 litres of hot water in one hour (this is allowing for 75% efficiency and water raised from 15°C to 80°C. We have not taken losses from the tank into account due to poor thermal insulation). Instant hot water heaters are slightly more efficient (stated as 95%), but the largest unit has an input of 152MJ/Hr (42kW) (142,800 BTU/Hr) and this can produce only 24 litres per minute with a temperature rise of 25°C. Incoming water is generally approx 12°C, so the output is really only 18 litres/min as the water from the head of the shower has to emerge at 44°C for a shower at 42°C. The water looses 2°C in falling. This hot water unit is suitable for a 12 litre per minute shower, but hopefully no-one else in the house will turn on a tap when someone is showering! The actual cost of taking a shower is quite expensive. The shower-head used by the author is 5cm diameter and has medium-sized holes. The rate of flow was measured at 7 litres per minute at a temperature of 43°C. If the inlet water is 20°C, the temperature-rise is 23°C. 1°C, we can work out the heat required and the cost. Gas usage per minute = 0.67MJ = 1.6cents per minute. Gas heaters are only 75% efficient and the cost of keeping the water hot, adds another 30%, making the total about 2.7 cents per minute. Many houses have a mains-pressure gas or electric hot water storage unit. They are better than instant water-heaters as the temperature of the water is more reliable. The temperature of instant heaters seem to fluctuate according to the pressure of the mains, especially if someone else in the family turns on a tap. We will deal with only a mains pressure GAS HOT WATER storage unit with a capacity of 135litres. This is one of the smallest units on the market and the tests were taken over a 14 day period of time to make them reliable. Gas heaters are only 76% efficient when heating the water, 24% of the heat is wasted as flue heat. This figure has been taken from Vulcan specifications: Input 35MJ/hr Output 7.3kW. But there is another inefficiency to take into consideration. To keep 135litres hot, takes 3.35kWhr each day. This is almost another 25% of the heat required to maintain temperature. This means the overall efficiency of a gas hot-water heater is about 50%. No-one has ever taken the trouble to work out the efficiency of this type of heater and a larger storage unit would be slightly more efficient. But the inefficiencies are considerable when you consider 100,000's of heaters are used in each country. Again, this is clearly more than any electrical outlet can supply. That's why we use gas. Cars are another factor in using fuel inefficiently. A standard petrol car uses about 30% of the energy of the fuel to move the car. The remaining 70% is lost in noise and heat. An average car uses 10 litres of fuel to travel 100km. The energy from a litre of fuel is about 45MJ/kg but a car can only produce about 17.6MJ/kg of work. If a car travels at 100km/hr, it consumes 10 litres or 8kg of fuel. On a cost-basis, the 39kW has cost the motorist $12.00 or 30cents per kWHr @ cost of petrol = $1.20 per litre. On a distance-basis, the cost to the motorist is 12c per km. The actual cost of fuel (petrol) is 12c per kWHr - meaning the amount of heat that can be obtained by burning the fuel in a 100% efficient reaction. The cost of LPG (Liquefied Petroleum Gas) is about 7c per kWHr. - meaning the amount of heat that can be obtained by burning the fuel in a 100% efficient reaction. LPG has 80% the calorific value of petrol on a VOLUME BASIS and this is how we buy each of the fuels. In other words, if 10 litres of petrol moves a car 100km, 10 litres of LPG will move the car 80km. LPG in Australia currently costs 50% of unleaded petrol and since it has only 80% of the calorific value, this equates to 60% the cost of unleaded petrol on a mile-for-mile basis. We hear so much about cars of the future being electric. To charge an electric car from a normal power point is going to take many hours. A 240v normal power output will allow 10amps to flow without overheating the wiring. The model T Ford had an output of 10 brake horsepower and this was considered sufficient for the first 10 million cars. However an electric car will need to have two 5HP motors to be equal to the Model T Ford but these are much more "effective" than a petrol motor of the same rating. An electric motor will provide much more acceleration and provide much more performance than a petrol motor. If the car is driven very carefully and the requirement is not more than the equivalent of 5HP, it will get a range of 300km. The stored energy will need to be 8 x 2400 = 19,200 watt-hrs. The 12v battery in a normal small car is about 50 amp-hrs or 600watt-hrs and a 12v battery in a large car is about 90-100amp-hrs or 1,200watt-hrs. This means you would need 20 x 12v large batteries to power the electric car we are discussing. Car batteries produce about 100watt-hrs per kilogram. This means we need 19,200/100 = 192kgm of battery. Thus you can see a petrol car of the same horsepower rating would cost about the same to run. But the petrol car would need only 20km of fuel, as opposed to 192kgm for batteries and the petrol car can be refueled instantly at any petrol station. In an electric car you are carrying around the dead-weight of at least 2 passengers in the form of a battery. 5 - 10HP will propel you along a flat road at 80km/hr with 1 passenger (and 192kgm of batteries) but will slow you to less than 50km/hr on a hill. Don't forget, the weight of your electric car will be more than a model T-Ford. The only way to work out the overall cost of energy in a household is to work out the ENERGY CONSUMPTION per day. We will take the example of a single person. For two people, add 20% and about 10% for each additional person. There are 5 energy requirements: Heating, lighting, hot water, cooking and appliances. We have already mentioned the cost of heating is 1kW for an "standard room." If the room is heated from 5pm to 11pm, the consumption will be 6kWHr. We will allow a total of 1kWHr for lighting per day. A 10 minute shower using 11 litres per minute will use 110 litres of water. 50% of this will be hot water, requiring an input of 4.5kWHr. Fridge, washing machine, kettle, micro-wave oven will consume another 2kWHr per day. A TV adds another 2kWHr. The total minimum is: 15.5kWHr per day. This is an average of 620 watts continuous but the demand comes in bursts and this could be as high as 5kW for a short period of time - such as a kettle and tumble-dryer at the same time. That's why a household needs three different forms of "renewable energy" - if you are deciding on renewable energy. The biggest problem with all forms of energy generation, is storing or producing the energy when required. The problem is to store it during the day and use it at night, or to store it from one week to the next or from one season to the next. If this could be converted by a heat-pump to high temperature energy and stored in a water-tank or heat-bricks, we would never need to buy energy again. A simple steam turbine could be used to generate electricity and we would be self-sufficient for ever. But this is sadly not possible for everyone. That's why the energy utilities are using us as "piggy banks." Electricity is supplied to Alcoa (an aluminium manufacturing company) for 3.5c per kWHr and Liquefied Natural Gas is supplied to China for 5c per litre. Our costs are 17c and about 75c. This brings up two points. If we paid less for electricity and gas, would we use more? If we paid less for energy, would be invest in "alternative sources?" Don't get hooked on the carbon dioxide debate. Carbon dioxide comprises only about 0.03% to 0.06% of the content of air and it has only risen 0.001% in the past 100 years. It is a contributing factor to global warming but when you realise the amount of heat delivered to the earth from the sun, the effect of bush-fires and things like steel production, the contributing factor of households is miniscule. Look at the wasted street lighting and office lighting at night-time. Freeways could have the lighting triggered by vehicle movement so that whole highways of lighting could be turned off when no traffic movement is detected. Australia is one of the largest polluters of the planet. Maybe not directly, but by mining hundreds of millions of tones of coal and iron ore, the end result is millions of tones of carbon dioxide released to the atmosphere ever year. (330 million tons - coal 320 million tons - iron ore). It does not matter if the carbon-dioxide is released in China or Australia, the end result is world-wide pollution. Each kg of coal produces nearly 3kg of carbon dioxide. Australia produces 1,000 million tons of carbon-diode per year due to the burning of its mined coal. kWhs are the most common unit electricity is measure in. For me the easiest way to think about it is to think about light bulbs. If you had ten 100W bulbs, and you left them on for 1 hour, they would have consumed 1000Wh (Watt-hours), or 1kWh (kilo meaning thousand). An old one bar heater is usually a 1kW heater, meaning if it was on for one hour, that would be 1kWh. Finally if you left one 100W bulb on for 10 hours, you would consume 1kWh. So, to take that in Car mode. A petrol car that gets 35 miles/gallon would equate to about 0.8 kWh/mile, or 1.29kWh/km. So driving your car for 1 km, and leaving 21 X 60Watt bulbs lighting for one hour… is about the same. Or look another way… to drive 1 km takes about 36 seconds. 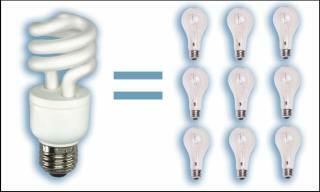 In lighting terms that is equivalent to 2150 X 60watt bulbs… Yes.. your car is equivalent to 2150 light bulbs. Far more if we were to consider the energy efficient type of bulbs! You can actually do much better than 100% with electricity. It’s counter-intuitive I know but a dual-cycle air-conditioner gets more like 350% efficiency (and even more for ground-sourced versions). i.e. you “burn” 1 kWh of electricity and get 3.5 kWh of heat into your house. It’s called the “coefficient of performance” … and it’s not anything to do with free-energy… essentially it works because the refrigeration cycle makes the refrigerant extremely cold (say something like -70 degrees). Then, when you put it outside it can gather a huge amount of energy from the relatively hot outdoor air. The air might only be 5 degrees, but that makes it 75 degrees hotter than your refrigerant. There is a lot of energy transfer with such a big temperature difference. You then get to put this energy into the house as heat. Let's look at one of the worlds biggest frauds. To be more specific it's electricity generated via solar panels. If we take the cost of producing a solar panel and compare it against the electricity generated, we find an amazing disparity. Even though the cost of producing electricity via coal has a side-issue of carbon-dioxide production, the increase of carbon dioxide in the atmosphere over the past 100 years has been less than 0.001%. Burning 1kg of coal per hour will produce about 9kWhr (at 100% efficiency). Coal fired electricity generating plants are about 25%efficienct, so that 2kWhrs of electricity is produced from each kg of coal. This means the return is about 7 cents, as electricity is sold by the generating plants for 3.5c per "unit" and bought for 45cents to 60 cents by the consumer (via the Australian Solar Electricity Scheme). The Australian government is offering $8,000 plus $1450 = $9,450 for a 1kW solar system in the form of 6 x 175watt solar panels attached to the roof. This system will produce a maximum of 5kWhrs per day over a period of a year for areas such as Victoria. The second part of this rort (fraud) is the condition that an electricity provider will buy back electricity at the rate of 45-60 cents per kW-hr, even though they are providing electricity at the rate of 16 cents per "unit." This is one of the "gimmicks" provided by the government to encourage householders to "do their bit for the ecology." When you work out the energy required to manufacture the solar panels, the wiring and the cost of the inverter, you will never recoup the damage to the environment. The poisons produced by the etching and cleaning of the silicon wafers far exceeds any savings in carbon-dioxide. None-the-less, 100,000 Australians have signed up for the scheme and put the government in the position of having to halt it as it overflowed by more than 700 million dollars in a single year. If you work out the effectiveness of the scheme, it has cost 700,000,000 dollars to produce 100,000 x 5 x 365 x 25 years = 15 cents per kW-hr over the lifetime of the project. Compare this with electricity production at 3.5 cents and selling for 16cents. The government could build a generating plant for $700 million and sell the electricity it generates. Obviously a $700 million plant would produce more than the 500Megawatt-hrs produced by the solar panels per day. The solar panels are actually outputting at a constant rate equal to a 20MW generator (5/24hours). Solar production is one of the most inefficient (and costly) methods of production. Although hydro involves a massive infrastructure and damage to the environment, it offers a dual return in providing water throughout the year and electricity generation. But there are other alternatives that produce enormous amount of electricity. 2. Tapping the heat generated at varying depths from a body of salt water. 4. The amount of energy generated from water flowing into and out of a bay each day is phenomenal. Almost every country has one or more of these energy sources available for exploitation and it is time for governments to consider tapping these reserves and delivering at a rate not exceeding 5c per unit. If the Australian government has a little intelligence, it would have put its $700 million to better effect by exploring water, wave, wind or tidal energy. A wind turbine costs approx $1.5 million per megawatt. You do the sums and see how inept the government is. Now we come to the point of being able to produce energy at a lower cost. Unless you have a thermal geyser under your property, the only three inputs you have available are: wind, sun and water. One of the most popular methods of generating electricity is wind. It has been proven that a large wind turbine can produce about one megawatt of electricity on a fairly constant basis when the turbine is placed in a windy location. The recent debate of their ugliness has been overturned and the disgusting fraud perpetrated on the industry by nature conservationalists has been exposed. They predicted birds would be killed when they flew into the blades (turning at 20rpm!) and sure enough, dead birds were found on the ground soon after the turbines were installed. So the authorities installed cameras and found the conservationalists were dumping dead birds during the night! When you get up close to a 30 metre tower and see the revolving blades, it is certainly a sight to inspire. The turbines are only a few hundred metres apart and a few acres of land can generates 15 megawatt. 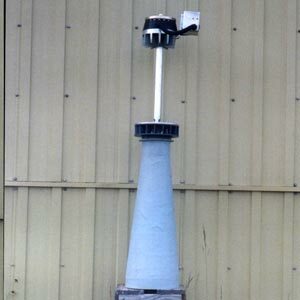 The only deterrent is the cost of installation and this will come down when they are mass produced. The cheapest type of generator is water. For any type of water turbine, it will operate 24 hours a day. 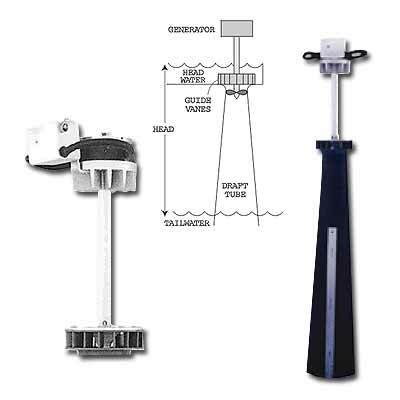 The diagram below shows a water turbine that produces 200watts of power with only two feet of head and a Kilowatt of power -- enough to completely power an average household -- with only 10 feet of head. The design uses a very clever "draft tube" to take advantage of the falling water and thus draws the water through the blades of the turbine. The second photo shows the unit on a wooden seat. The "draft tube" is clearly seen. The third photo comes from a company based in Jakarta, Indonesia. They represent manufacturers from Europe, US and other Asian countries. The two generators look very similar. The US company sells the generator for US$2,200. Suppose it lasts for 8 years and produces 24kWHr of electricity per day. The cost per kWHr will be 3.1 cents. Another type of water turbine is shown in this movie (1MB). The diagram below shows how the blades are turned so they do not present themselves fully to the oncoming water. This provides a much-greater area to the flow of water in the forward direction but introduces a number of joints at the top and bottom of each blade, that need to be protected from wear. A much simpler and more efficient solution is to mount the turbine transverse on a barge so that only the lower half of the drum presents itself into the water. In this way the returning blades would not be forced against the flow of water. The shaft could also be taken to an in-line gearbox to increase the rpm about 7 times and the output from the size presented in the 10 second movie would generate about 5kW. Installation costs would also be reduced enormously. The diagram below shows how the vanes turn to reduce the force against them when they are returning. A very clever idea but quite complex. The cost of a 1kW design is $5,000 plus $5,000 for installation. The projected cost for the electricity produced over a 10 year period is 50c per kWHr as per the website. There are a number of other designs including an under-water model shown in the photo below. It will produce 100 watts in a fast-flowing stream. By far the best place to look for any items associated with renewable energy is on eBay. Suppliers and manufacturers are very reluctant to provide prices, whereas eBay gives a huge choice of items and prices. Similarly, a search for articles on renewable energy via Google will provide you with a huge range of options. After searching the web for some considerable time, the following figures were found for power generation from water and wind. It can be clearly seen that the power available from a simple water turbine is much greater than a wind turbine due to the density of water. where p the density of water, A the area swept by the rotor blades and V the stream velocity. The marked difference in power generated by water compared to that of wind, however, may be seen from the table for various velocities assuming a density for water of 1000 kg/m3 and an air density of 1.2473 kg/m3 corresponding to air at 10°C. A stream of water flowing at 10 metres per second has the potential to generate up to 5 megawatt of electricity for a simple paddle measuring one square metre! We can only get a maximum of 60%, but even if we could only get 1%, it would represent 50kW! There is much more energy in a flowing stream than we have ever been told and it will just take someone to produce a simple paddle wheel connected to a pulley to drive an intermittent pulley that drives a final pulley on a generator. The two stages of drive are needed to get the rpm up to about 1000 rpm to make the generator efficient. A single v-belt will transmit about 5-10HP so you will need a pulley at each end of the paddle and two or four 5kW generators to get enough for a dozen houses or so. All the merging of the output of the generators can be done with electronics and it's just a matter of fabricating the paddle on a barge. This type of power generation plant will not upset the flow of any river as no dam needs to be constructed. The barge is held to the bank with a pole on a loop and will rise and fall with the river. The barge is also tied in position with guy wires. All this can be done for less than $10,000 and the electricity supplied at about 5c per "unit." Surplus electricity is passed to "dummy loads" consisting of heaters in a water tank. In this way the system heats water for the household as well as all the other requirements. While on the topic of energy conservation, we hear a lot about "saving the planet;" buy high-efficiency globes. Our local council is providing a FREE change-over service. They will change all your "inefficient incandescent globes" for Compact Fluorescent Lights. One CFL will outlive 9 ordinary globes!!!! But have you considered the amount of energy required to manufacture all the components in a CFL. The picture above shows the enormous number of components required to produce the high strike-voltage and current-limiting once the tube has struck. What is going to happen to all the good globes that have been replaced! What is going to happen to the CFL lamps when they eventually fail? What is going to happen to the tiny amount of mercury gas if the lamps get smashed? 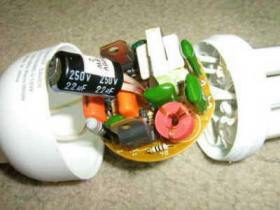 Most of the CFL lamps fail prematurely due to heating and drying-out of the electrolytic and faulty solder-joints. Most do not see the predicted "9-lives." The reason is the lamp is mounted up-side-down from the ceiling and the heat from the lamp rises and heats the electronics. This was never taken into account when the lamps were "soak-tested." What is the point in saving a few watts when Australia is supplying China with millions of tons of coal each year? The ships are lined up at the wharf, 24 hours a day waiting to be loaded. Each kilo of coal produces 2kg of carbon dioxide. What about looking at the city with the lights in every office burning 24 hours a day. What about looking at the lighting under bridges. If you count the number of 500watt bulbs per underpass, you could supply 100 houses with electricity. No. It's all a myth. We are not "saving the planet" and no amount of conservation will overcome the enormous amount of degradation taking place by the multinationals. Not that they are to blame. It is the consumer that wants everything wrapped and presented in an attractive way. It is the consumer that "half-uses" everything and throws the rest away. You only have to look at hard-rubbish collection each year. Nearly every house has a TV, microwave oven, chair, lounge, BBQ, VCR or computer to be picked up. And the next year the pile is even greater. Our houses are absolutely stacked to the ceiling with devices we use as well as devices ready for the tip. You have to remember one thing. Every shipping-container of product that lands on your shore will have to be dumped in a tip at some time. Our sea-terminal gets 500,000 containers per year. Multiply this by the number of terminals in the world. What is changing 20 globes going to do to conservation? Think of it in fractions of a millionth of one percent. One interesting thing that has come from LED technology is the improved clarity and truer colour produced by LED street-lighting. 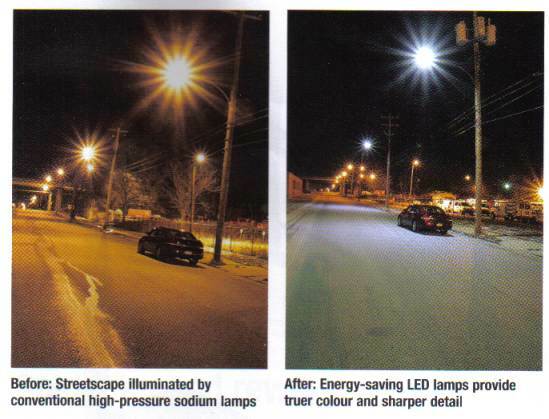 The photos below seem to show the improved appearance from LED lights, over the sodium lamps. I have not seen the improvement myself. The LED lamps use approx 50% less energy. The improvement may be due to the resolution of the camera and may not be seen by our eyes. Is it possible to imagine people powering their cell phone or music/video device while jogging on a sunny day? A University of Southern California team has produced flexible transparent carbon atom films that may have great potential for a new breed of solar cells. In a paper recently published by the journal ACS Nano, researchers stated that organic photovoltaic (OPV) cells have been proposed as a way to obtain cost effective energy due to their ease of manufacture, lightweight, and compatibility with flexible substrates. This work indicates that graphene, an extremely conductive and highly transparent form of carbon consisting of atoms-thick sheets of carbon atoms, has high possibility to fill this role. While graphene's existence has been known for decades, it has only been studied extensively since 2004 because of the impracticality of manufacturing it in high quality and in quantity. The University of southern California team has produced graphene/polymer sheets ranging in sizes up to 150 square centimeters that in turn can be used to create dense arrays of flexible organic photovoltaic (OPV) cells. These organic photovoltaic (OPV) devices convert solar radiation to electricity, although not as efficiently as silicon cells. The energy provided by sunlight on a sunny day is approximately 1,000 watts per meter square, for every 1,000 watts of sunlight that hits a square meter part of the standard silicon solar cell, 14 watts of electricity will be generated, Organic solar cells are less efficient; their conversion rate for that same 1,000 watts of sunlight in the graphene-based solar cell could be only 1.3 watts. But what graphene organic photovoltaic (OPV) lack in efficiency, can potentially be compensated by its lower price and, greater physical flexibility. Researchers think it may eventually be possible to cover with inexpensive solar cell layers extensive areas like newspapers, magazines or power generating clothing. In the meanwhile Prof. Ruoff and his colleagues of the mechanical engineering department at the University of Texas at Austin, are studying the basic science in the development of graphene-based ultracapacitors for usage in electronics and other fields. Prof. Ruoff says batteries are relatively slow, they can store energy but require sometime to charge up, and then they distribute energy slowly, in time. Ultracapacitors can be charged quickly, in seconds, and discharge very quickly, but, today, they can’t store very much electrical energy. The development of stable and less expensive ultracapacitors could be a key step in using wind or solar-generated power, particularly if researchers can find methods to enable capacitors to store energy longer, that is not yet possible. Even with their current storage capacity, the graphene devices could provide quick energy when needed in certain situations on the green way. They could be used, for instance, to absorb heat generated in braking a car or train, and store it for a short time, and use it for the electrical needs of the vehicle (i.e. starting the vehicle or acceleration). Sophia H. Walker writes for the solar powered battery charger blog, her personal hobby web log related to tips to help people save energy using solar power for small accessories.